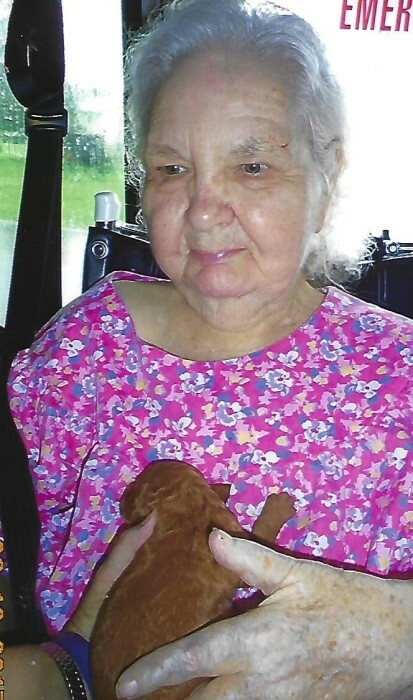 Mary Eileen Keefer, 84, of Oakland, MD died Saturday, April 6, 2019, at Dennett Road Manor Nursing Home, Oakland. Born March 5, 1935, in Oakland she was the daughter of the late Luther and Betty (Lewis) Kerns. She was also preceded in death by her husband, Clarence Keefer; one brother, Lawrence Kerns; and an infant sister. Mary was a homemaker and a member of the New Beginnings Church, Oakland. She is survived by two sons, Ray Keefer and wife, Patty; John Keefer, both of Oakland; two daughters, Iva Crosco and husband, Lester; Susan Friend and husband, Roger, both of Oakland; two brothers, William and Richard Kerns, both of Florida; two sisters, Margaret Crane, Texas; Barbara Kerns, Delaware; one half-sister, Judy Kerns, West Virginia; four grandchildren, Andrew Cooper, Jessica Friend, Angie Crosco, Eric Crosco; six great-grandchildren. Friends will be received at Newman Funeral Homes, P.A., 1100 Memorial Drive, Oakland, on Sunday and Monday from 2 to 4 and 7 to 9 p.m. Services will be conducted in the funeral home chapel on Tuesday, April 9, 2019, at 1:00 p.m. with Reverend Russell Liller officiating. Interment will be on the Keefer Cemetery, Oakland.